Israel's capital 'City of Gold' was bathed in dazzling light this week during the 2nd annual Jerusalem Festival of Light. Israel's 'City of Gold' was bathed in dazzling light this week as the second annual Jerusalem Festival of Light mesmerized residents and visitors to the nation's capital. Traveling from all over the country to witness the artistic display, Israelis enjoyed strolling in and around the ancient walled Old City June 10-16, viewing light displays which were, for the most part, free of charge. For a fee, visitors could enjoy the opening ceremony -- The Light Concert in Sultan's Pool -- opposite the Old City walls and thousands did so. The Jerusalem Symphony Orchestra played light classical music while lights beamed towards the sky in time to it bounced back from the clouds. The players were bathed in myriad colors of shimmering lights. The program began with an orchestrated medley of songs of Jerusalem and included a surprise--simultaneous fireworks and beams of light during the playing of Tschaikovsky's 1812 Overture. . Flautist Noam Buchman played "From the top of Mount Scopus" as the finale. For 50 shekels a ticket, The History of Light show incorporated acrobatics and dance with video screening, lighting effects, pyrotechnics, and sound. 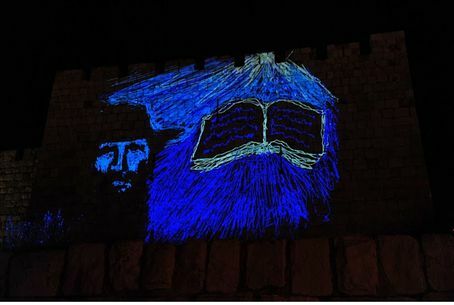 Jewish-inspired projection on the Old City walls. People of light descending in Jerusalem. An artist blowing glass to create a new light fixture. A boy sits as a new friend relaxes in the nearby hammock. The newly-rebuilt Hurva synagogue with a projection of a religious man amidst holy books. A mosaic projection on the Hurva. Religious Jews walk through a sea of lit reeds. More light reeds outside Jaffa gate. The stars shine brightly in Jerusalem.